Here are the results of the giving for "Increasing Our Lights." Thank you so much for your sacrificial generosity! Listen and watch Pastor Gary's explanation of our Advent Project given on Sunday, 11/25. The Land Use team formed January 2017. At our January 2018 meeting the congregation voted in favor of moving forward with a building addition and land development project once $300,000 was secured toward the project. 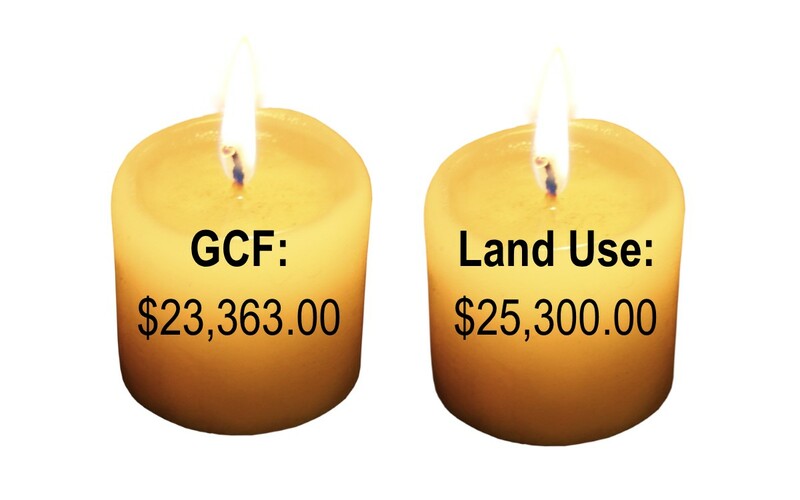 However, over the course of 2018 the congregation decreased giving to the General Fund so that, currently only $150,000 is available for building and land projects, essentially the same as 1 year ago. The Governing Board sought to determine which of the proposed projects are most helpful to the overall mission and impact for our church. While the building addition (even a reduced plan which came in at an estimate of $400,000) would help to improve our facility, the proposed pavilion, landscape and children’s play area seems the best investment for the next phase in the life of the church. During these deliberations we were also informed that an historic number of prepared International Worker appointees, 60 this year, are ready to enter overseas missionary service. Don and Rachel Schaeffer are 2 of those appointees. But, the Great Commission Fund is currently $1.2 million underfunded in this fiscal year which began July 1. Unless this deficit is reversed some or even many of those appointees will not be sent this year. In light of these realities, we’ve adjusted our proposed end of the year projects to 2. “Increasing our Lights: Locally and Globally” is our Advent and end of the year projects. Will you join us in matching the ‘Unprecedented number of appointees’ with an unprecedented sacrifice toward accomplishing both of these objectives this year? Watch the video below to hear the president of the US Christian and Missionary Alliance, Dr. John Stumbo, talk in detail about the current deficit in the Great Commission Fund (GCF).